The Windwing Cruise Control CC bar is a work in progress and ever changing. It is a complicated double-pulley sheeting system for extended range and silky-smooth resistance. 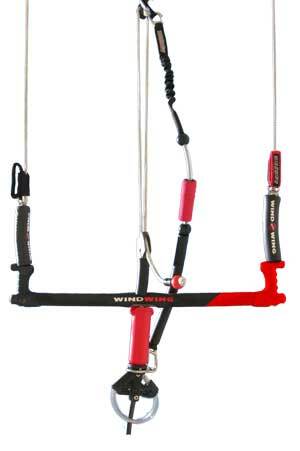 The bar stays in place for one-handed and no-handed flying, and reduces rider fatigue. The CC bar features a tapered composite bar with raised EVA grip, spinning leash with Delrin collar, handle pass leash attachment, optional grab handle safety release and more. This is the sweetest and smoothest bar out there. The B-Safe bar is the most efficient, cost effective, sensible and safest way to get going on a Windwingkite. Available in 3 sizes: 45cm, 50cm, and 56cm, the bar is a tapered composite bar with raised EVA grip and comes with the latest Windwing B-SafeQuick Release Saftey System. This newly designedB-Safe System is fool-proof, intuitive and solid. All parts are interchangable to cover a wide range of riding styles and they are easily replaceble for optimum maintainance and safety. Fitted with theWindwing exclusive Stopper Bell, the B-Safesystem is truly universal in design and easily adaptable to any other existing bar and kite in the market.